Schatz, JCC of Hawaii and Honolulu JACL present petitions to interior secretary. 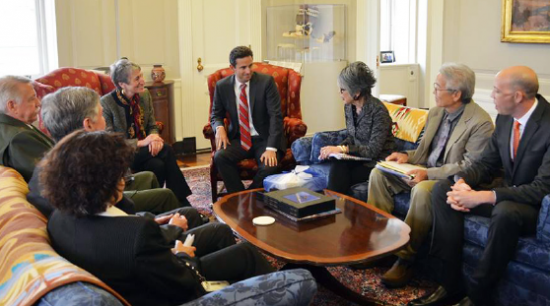 WASHINGTON – Sen. Brian Schatz (D-Hawaii) on Thursday joined Carole Hayashino, president and executive director of the Japanese Cultural Center of Hawai, and Jacce Mikulanec, president of the Honolulu Japanese American Citizens League, to present Interior Department Secretary Sally Jewell with petitions from more than 6,000 Americans requesting the inclusion of Honouliuli Internment Camp in the national park system. Last year, Schatz met with National Park Service (NPS) Director Jonathan B. Jarvis to discuss the need to complete the special resource study, which was authorized by Congress in 2009 to review the site for potential inclusion in the national park system. Following the meeting, Schatz sent Jarvis a letter to reiterate his position. In September 2013, Jewell visited Honouliuli Gulch, where she saw remnants of the confinement site that historic documents indicate once held 175 buildings, 14 guard towers, and over 400 tents at the 160 acre camp. Jewell also met with local leaders and members of several Japanese American cultural organizations who are part of the growing chorus of voices who want to see this difficult chapter in the nation’s history preserved and interpreted for the benefit of generations to come. In 1943, the Honouliuli Internment Camp was constructed on Oahu to intern citizens, resident aliens, and prisoners of war. The camp held approximately 320 internees and became the largest and longest-used World War II internment camp in Hawaii. The NPS held a series of public meetings throughout Hawaii last May and June to present the draft study report, answer questions, and accept comments. Following receipt and review of public comments, a final report, including a course of action recommended by the Jewell, will be transmitted to Congress.